This is often how things work with me. I decide at some point that I want something. Pizza, cookies, a madeleine…and since I’m eating a gluten-free diet, I can’t always go to the store to buy it. Or, maybe I can but it’s not always good. So it was, that day, when I really wanted a good biscotti. Believe it or not, I’ve never even made them, even with gluten! The next part of the journey began with finding the right recipe. I wasn’t in the mood for lemon pecan or orange walnut. I didn’t want chocolate either. Cinnamon almond was coming to mind so that’s what I decided to try to create. I used this recipe from one of my favorite bloggers, gluten-free girl, and made a few changes, including using less sugar. The real test was in serving these little delightful treats to my non-gluten free friends. All were pleasantly surprised when I told them my little secret. I hope you try it and know you’ll like it! 1. Preheat the oven to 350°F. Place a piece of parchment paper or a Silpat on a baking sheet. 2. Add the dry ingredients into a bowl (flours, baking powder, salt, xanthan gum, and cinnamon). Using a whisk, mix until well blended. If necessary, use your fingers to break up any big pieces of almond flour or baking powder. 3. Put the butter in a stand mixer. Using the paddle attachment, beat the butter for about a minute and then pour in the sugar. Cream the butter and sugar together until the batter is smooth, about 3 minutes. Add the eggs one at a time until the mixture is fluffy. 4. With the mixture on low, add the dry ingredients in 3 batches. Turn the speed to medium and mix for 1 minute. This helps to “gel” the xanthan gum and hold the dough together. Lower the speed and add the almonds until just mixed. 5. The dough will be sticky. 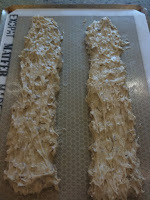 You can either use an ice cream scoop to place the dough on the baking sheet in two long rows or use a greased spatula. Pat down and form each into it’s own long log with a spatula. It should be a little flat as well. And yes, it will be sticky. 6. Bake the biscotti for 16-18 minutes, turning around once. Bake until golden and somewhat firm, but still somewhat soft, pushing the top center of the cookie. This is the best way to tell whether it is done. Once done, take the baking sheet out of the oven and allow the biscotti to cool for 10 minutes. Carefully, move them to a cooling rack and leave for at least 30 minutes to firm up. 7. When the biscotti are entirely cool to the touch, place one log on a cutting board. With a serrated knife, cut consistent slices, about 1/2″ wide, depending upon how you like your cookies. Move them back onto the baking sheet, bottom side down and repeat with the other log. 8. Heat oven to 350°F again. 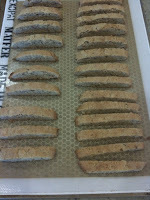 Once oven is hot, place biscotti back into oven. 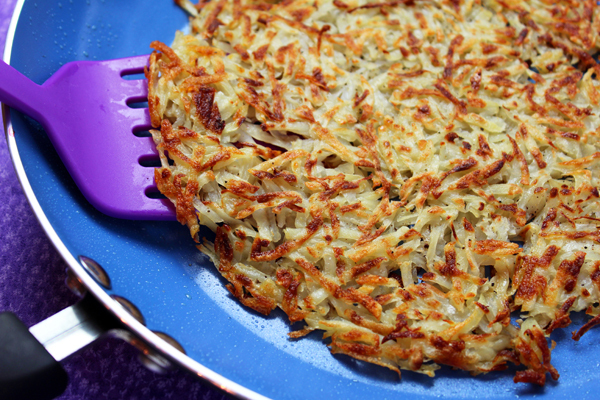 Bake until they are browned and crunchy, about 16-20 minutes. Cool them entirely before attempting to eat. Ok, try one if you are drooling but they are better once cooled! Store in an airtight container. Can you use. Better batter Flour Blend in placeof all the flours? You should be able to. I believe BB has xanthan so leave that out. Just not sure if it would be gummy (sometimes those mixes have a lot of gum, more than you might need in a recipe). Also make sure there are no other leavening agents like baking soda/powder. I have made the cookies with that and the almond flour, leaving out the sorghum. I like the texture of the almond flour in the cookie. You probably could do it by using only the flour blend. I (purposely) don’t add xanthan gum to my blend because each recipe calls for a diff amount. Hope that helps!